You might know that regular verbs are those verbs whose past tense and past participle (2nd and 3rd forms) are formed by adding “d” or “ed” to the end of the verb. Regular verbs are used a lot in daily conversation. Some of the ESL learners have a problem with pronouncing the “ed” ending. In the lesson below you will learn the pronunciation of ED endings in regular verbs. 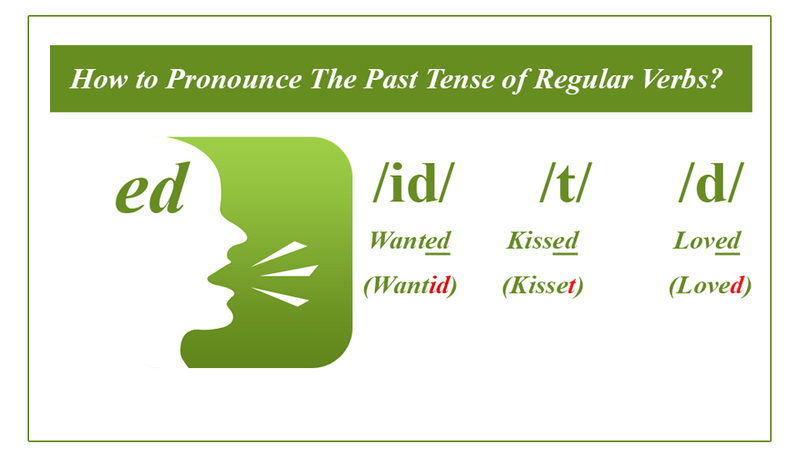 There are three different ways to pronounce the past tense of regular verbs. It depends on the final sound of the regular verbs. Case 1: If the final sound of a regular verb is an unvoiced consonant like: (K, S, Ch, Sh, F, P, Th) then the past tense of the regular verb “ed” is pronounced like “t”. Case 2. If the final sound of a regular verb is a voice consonant, vowel or diphthong ending, then the past tense of the regular verb “ed” is pronounced like “d”. The Other voiced consonants that come at the end of words: A, B, E, G, H, I, J, L, M, N, O, Q, R, U, V, W, X, Y, Z. So any regular verb ending in one these consonant sound, vowel or diphthong takes the “d” sound when “ed” is added. Case 3. If the final sound of a regular verb is pronounced like the letters “ T or D” then the past tense of the regular verb “ed” is pronounced like “id”. Great work bro, it would be better if you add voice conversation here. Thank you Amit, we will try to do so.